A new year brings lots of diet talk. Last week, the government released updated dietary guidelines, and most of the recommendations likely don’t come as a big surprise. Among the report’s findings are that Americans consume too much salt and too much sugar. In fact, the average American consumes up to 22 teaspoons of sugar each day, and the new recommendation is that sugar should account for only 10% of total daily calories. Of course, the above information is paraphrased and just a small snippet of what the report suggests. But it ties into the idea that we should read labels and know what’s in our food. While I do read labels, I’ve never been one to specifically count calories, carbs, or grams of salt. Instead, I aim for a well-rounded diet that includes lots of colorful produce, lean proteins, and whole grains. Precise numbers, however, really matter to many people–like a diabetic watching his carb count or someone with hypertension monitoring her sodium intake. For several reasons, I haven’t made a practice of including this information on my recipe posts. So often, I give a variety of choices within a recipe. Sometimes, there’s a logical range in the number of servings or other factors. Being mindful of personal preferences and creating flexibility within a recipe, however, can make it difficult to provide accurate and consistent nutritional data. Over the years, when people ask for this sort of information, I have referred them to a couple of sources that provide it in a user-friendly way. My favorite resource, however, is Calorie Count. This site allows a user to copy and paste all of the recipe ingredients at once instead of searching through a large database for individual ingredients. The number of servings can be inserted before clicking on “analyze recipe,” and up pops all the pertinent details. As an added bonus, recipe can be saved on the site….and it’s free! Note: Caloriecount.com has a message indicating that it will no longer be providing this service as of March 2017. In anticipation of this, I’ve been looking for the most user-friendly, accurate options. So far, this is my favorite: https://www.verywell.com/recipe-nutrition-analyzer-4129594. So whether you’re being mindful of added sugar or counting every carb, trying to ramp up your protein intake or simply curious about the overall nutritional profile of a recipe that you cook on a regular basis, this might be a helpful tool. As I work on new recipes, I’m always listening to my readers and curious about their preferences. Always feel free to leave comments and requests regarding what you’d like to see in this space. Are you a number cruncher? And which values most concern you? 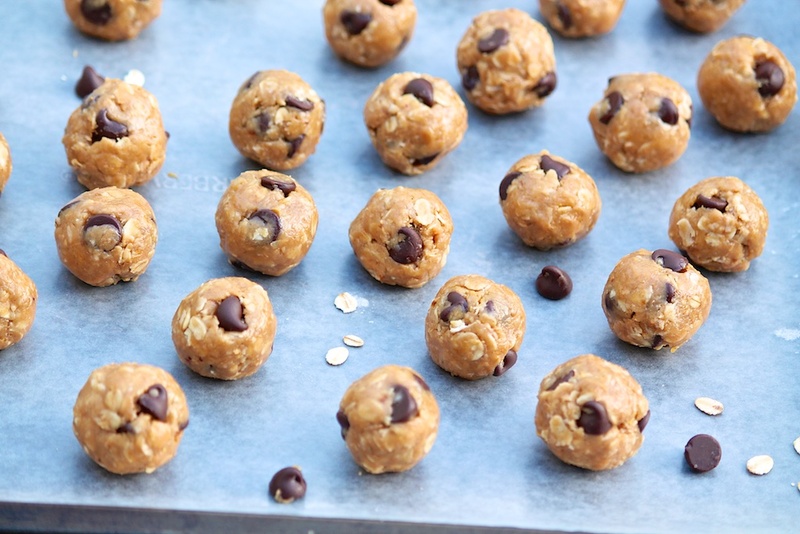 When I originally posted the recipe for No-Bake Energy Bites, I received several emails asking for the nutritional data. So I thought I’d use that recipe to show you what this tool looks like. 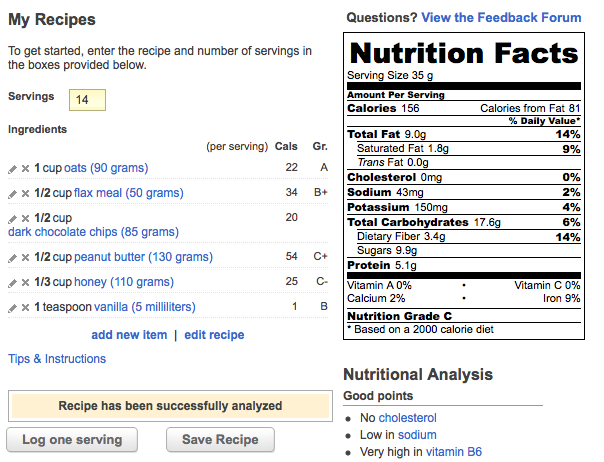 Here is a screen shot with all the details, using two “balls” as the serving size. Whenever I want to see the stats on a recipe, I come to this page and click through to the recipe calculator. Thanks for finding a new option when the first one ended its service. I like the new option as much–maybe more–and thought I should let you know! I’m so glad this has been helpful to you, Erin. I like the new option a little better, too!